I am so excited to be working with Mickey Adventures. 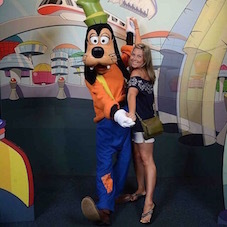 I have been helping friends, family members, and complete strangers (through referrals from family and friends) plan their vacations to the Walt Disney World Resort in Florida for years now. I am the proud mother of 3 beautiful boys and I work full time as a first grade teacher. I have been going to Disney World in Florida for as long as I can remember. We started going when I was 3 in 1983 and we just keep going back. My family and I travel there at least once or twice a year. I have the belief that when you are in Disney World, you are truly in a magical, real-life fantasyland. I would love to help you plan your vacation because I have had so many different experiences there. I have been there as a child, a teen, with just girls and on a romantic vacation. I got engaged in front of Cinderella’s Castle, had my wedding there and part of my honeymoon. I have been while I was 6-months pregnant, I have brought an infant twice and my 6 year old has already been many times. There are so many wonderful experiences at Disney, including the many amazing hotels and restaurants. I have stayed at most of the resorts and have dined at many of the restaurants. Giving resort and dining recommendations is my favorite part of the planning process. I can’t wait to help all your dreams come true! Contact me today to get started planning your magical Disney vacation! Connect with Grace on Facebook!